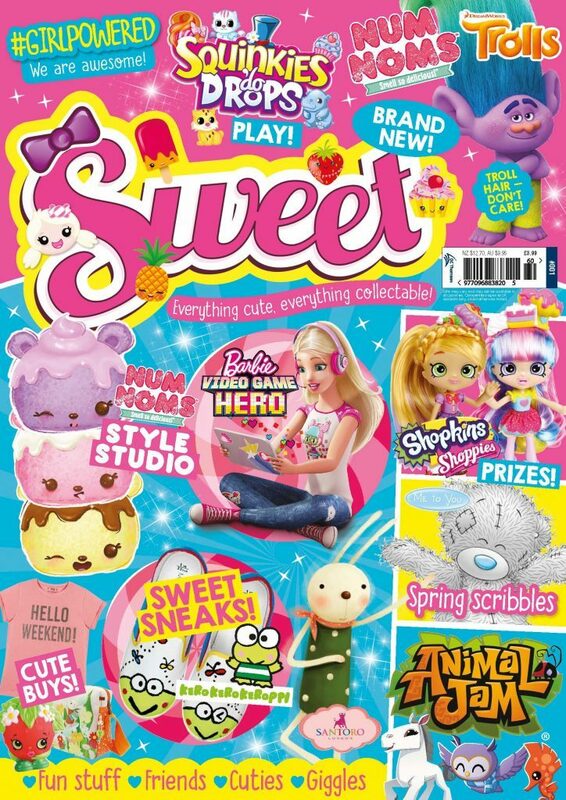 DC Thomson launches Sweet magazine - D.C. Thomson & Co. Ltd.
DC Thomson is launching Sweet, a new magazine for primary girls who love collectables, shopping and all things cute. The 36 page monthly magazine is a new launch aimed at girls aged six to 10. Content will cover all of the latest trends for girls, packed with stationery, accessories and cool, funny content. Puzzles and make-its will sit alongside current crazes such as collectables. Sweet is a trend focussed magazine that features brands that are current and in the readers’ lives. This ensures the magazine evolves with the reader and contains the best and most popular brands and packages. Confirmed creative content includes Trolls, Squinkies ’Do Drops, Shopkins, Animal Jam, Num Noms, and Santoro’s Kori Kumi. Exclusive covermounts on Issue 1 are an Animal Jam in-game unlock for every reader, Shopkins trading cards, and a cute collectable trio of fruity lip-glosses. Sweet launches this Spring. Issue one comes with six free gifts. If it’s in their life, it’s in Sweet!